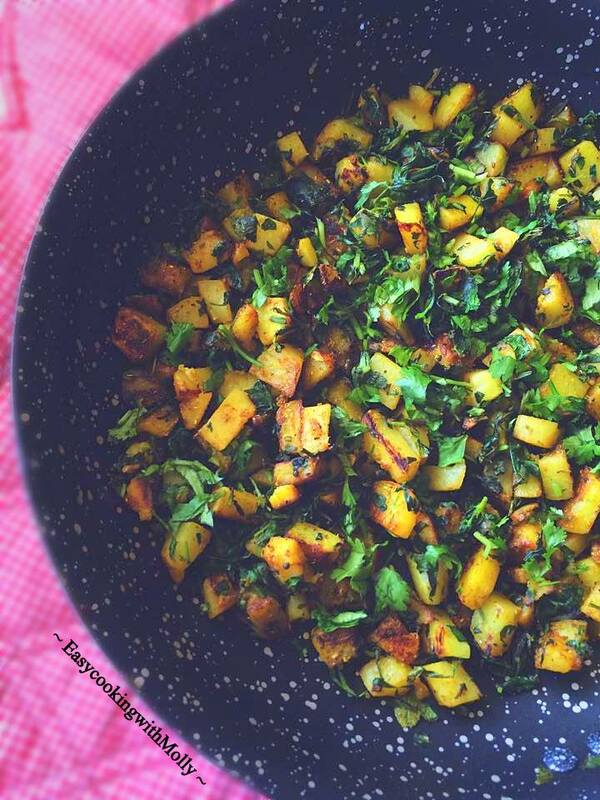 Sautéed Potato and Watercress – Quick Vegan Side: It’s delicious and packed with nutrients. ‘Eat More Greens‘ is something I strongly believe in and I also try to include many varieties of green vegetables. I realized that I have shared so many entree/mains recipes and have hardly posted any sides. Watercress, is a rich source of vitamins and minerals and contains particularly high levels of bone-building and strengthening vitamin K, vitamin A, which is important for eye health. It also tastes closest to one of our Indian vegetable ‘Fresh Fenugreek Leaves’ . Many of us have eaten it in salads or sandwiches but it also tastes great sautéed lightly. Also, the addition of turmeric in this Sauteed Potato and Watercress makes this recipe more power packed with health benefits. 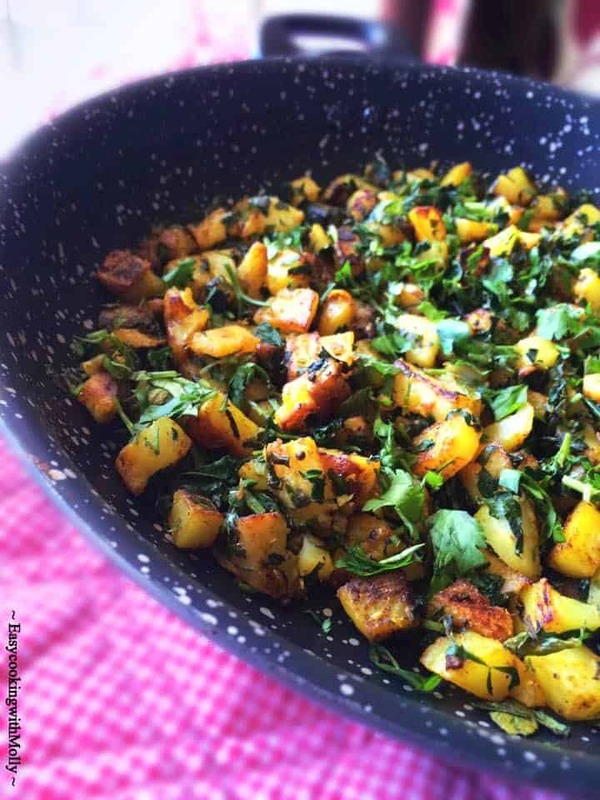 This Sauteed Potato and Watercress – Indian Aloo-Methi is perfect for a light lunch or dinner along with a toasted bread or with Indian roti. This can be stored in the refrigerator for upto 2-3 days. 3 Medium Potatoes - chopped into bite size pieces. In a non-stick pan, heat oil over high flame for a minute. Add, cumin, turmeric and sauté evenly. Now, add potatoes, all the spices and stir everything evenly. Lower the heat to medium, cover and cook for 6 minutes (stirring every minute). Add, fresh watercress leaves and sauté everything evenly. Cook uncovered for another 3 minutes (sauté every minute to prevent burning the veggies). Turn off the heat and transfer to serving dish. 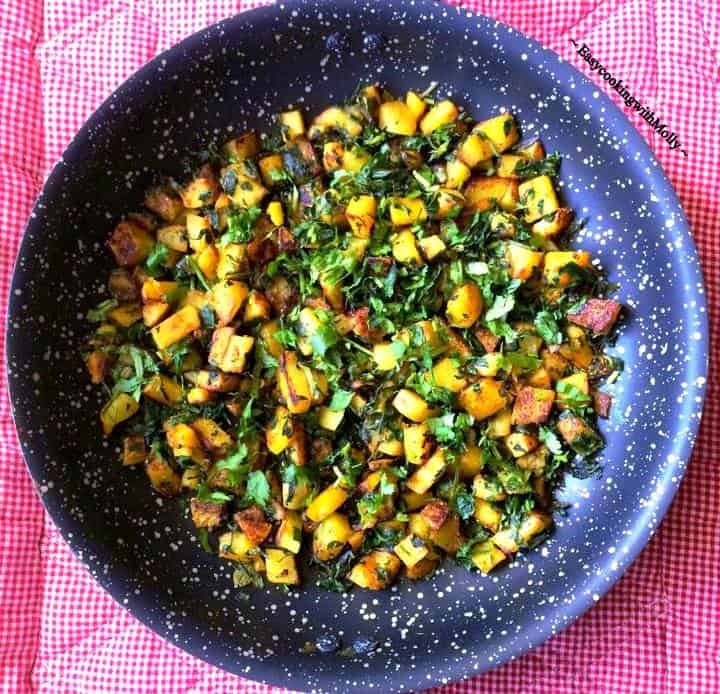 2 Replies to "Sauteed Potato and Watercress - Quick Vegan Side"
Hi Molly – thanks for the quick recipe. My watercress came out bitter. Should i have salted it first? Next time, I’ll mix spinach too to soften the texture. Hi Gina, I’m so sorry to hear that the watercress came out bitter, it happens sometimes and I think it’s a particular variety that’s mixed in the bunch. Definitely give it a try with spinach for a milder version.